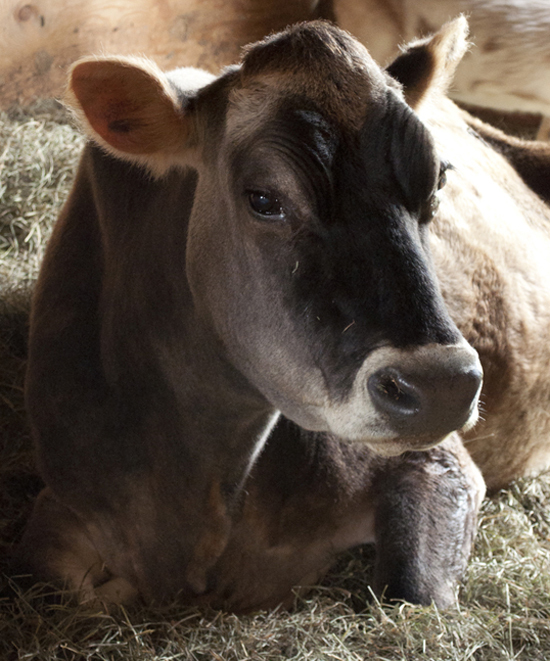 For the first ten years of her life, Gail was used as a dairy cow at a local farm, where she continually impregnated so that she would produce milk. Sadly, Gail had to watch as all of her babies were taken from her shortly after birth so that her milk could be sold for human consumption instead of providing nutrition for her babies. Gail was actually used for dairy for much longer than most cows, as dairy cows are typically sent to slaughter when they are around 4-5 years old. At that point they are considered “spent” because they are no longer able to produce enough milk and often have health issues due to being forced to continually have babies and produce milk. Fortunately, the farm’s owner had a change of heart and let MFS take Gail and several other cows instead of slaughtering them in 2005. One of the cows, Crystal, was pregnant at the time, and her son Habibi was born at MFS. When Habibi was a calf, it was heartbreaking to watch as Gail and the other cows frequently ran over to greet her wondering if she was one of their lost babies. We are so grateful that Gail has been able to live the second half of her life in safety and comfort at MFS. Gail spent many peaceful years grazing in our 125-acre field with our cow herd. As she got older and developed health issues, including arthritis, Gail was moved to a small barn where she can have peace and quiet and not be disturbed by some of our more rambunctious cows. She also has a roommate—Lilly the goat. Lilly has been known to have a bit of an attitude with other goats but she gets along great with Gail, and we often see the two of them hanging out together in the field behind their barn. Help Gail and other animals at MFS: Donate Now! Maple Farm Sanctuary is a 501(C)3 non-profit organization with tax-exempt status.